Rare presentation of Epiphyseal Aneurysmal bone cyst. Department of Orthopaedics, Govt. Medical College, Amritsar – 143001 (Punjab), India. Introduction: Aneurysmal Bone Cyst (ABC) is a benign expansile cystic blood filled reactive lesion of the bone, most common in the first 2 decades of life. Though it can involve any bone in the body but tibia, humerus, femur and posterior elements of spine are most commonly affected. They most commonly involve metaphysis or metaphysio-diaphyseal part of the bone. Primary involvement of epiphysis is rarely reported. 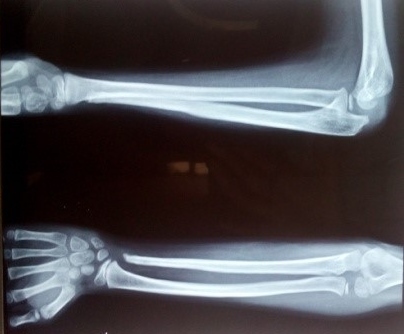 Here we present a case of 6 year old male child with an epiphyseal ABC of distal ulna. Its diagnosis, surgical management, clinical outcome with review of literature is discussed. Aneurysmal Bone Cyst (ABC) is a common benign locally aggressive lesion. It occurs more commonly in 2nd decade of life, though there is a wide range of age at diagnosis [1,2,3]. It can involve any bone of the body4, but most common locations are metaphysis of proximal humerus, distal femur, proximal tibia and posterior elements of spine. ABC can arise de novo, when it is called primary ABC, but there is high incidence of accompanying tumors in about 1/3rdof cases when it is called as secondary ABC. 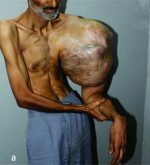 Giant cell tumor is the most common association. Others being osteoblastoma, chondroblastoma, chondromyxoid fibroma, non-ossifying fibroma, osteosarcoma, chondrosarcoma, unicameral bone cyst, haemangioendothelioma and metastatic carcinoma. Though exact etiology is not clear, it usually occur due to the altered hemodynamics in bone . 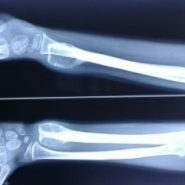 Patient usually presents with mild to moderate pain, swelling, deformity, pathological fracture and pressure symptoms, depending upon the site and aggressiveness of the lesion. Pathologically, aneurysmal bone cyst has been likened to a “blood-filled sponge”, composed of blood-filled, anastomosing, cavernomatous spaces, separated by a cyst like wall composed of fibroblasts, myofibroblasts, osteoclast like giant cells, osteoid and woven bone. In approximately one third of cases, a characteristic reticulated lacy chondroid like material, described as a calcified matrix with a chondroid aura, is seen. This supports the concept that aneurysmal bone cyst may be primarily a reparative process, probably the result of “trauma or tumor induced anomalous vascular process”. Although ABC most commonly occurs in metaphysis, but extension into epiphysis may occur due to its locally aggressive nature leading on to premature growth plate closure with resultant deformity [7,8,9]. However, primary epiphyseal ABC is extreme rare entity. 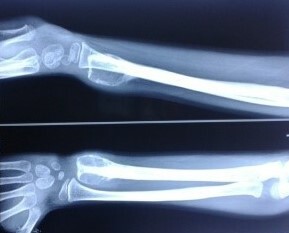 6 year old male child reported in OPD with complain of swelling and pain around left wrist for the last 5 months. There was no history of initiating factor, such as trauma or fever. On physical examination, there was fusiform swelling and tenderness over distal ulna of left wrist. There was essentially full ROM of the wrist. The overlying skin was intact with no signs of inflammation or infection. The neurovascular examination was normal. AP and lateral X Rays of the wrist showed expansile lytic lesion of distal ulna involving epiphysis with some metaphyseal extension(Fig. 1). 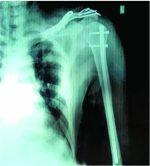 Treatment was done by surgical excision of distal ulna upto about one cm. proximal to the lesion. Fibular strut grafting was done and stabilized with k wire and pop cast applied(Fig. 2). Specimen was sent for histopathological examination which confirmed the diagnosis of ABC. 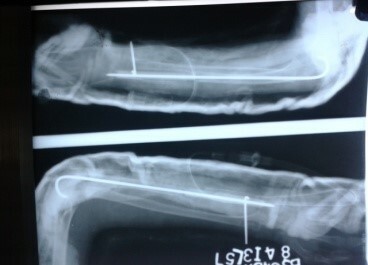 K wire was removed after three months. Postoperative follow up at 1 year shows good uptake of fibula with no recurrence of the lesion (Fig. 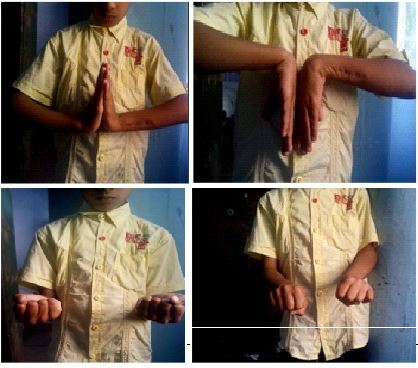 3), no deformity at wrist with good range of wrist movements (Fig 4). The aneurysmal bone cyst is the result of a specific pathophysiologic change, which is probably the result of trauma or a tumor-induced anomalous vascular process. Although the tumor most commonly occurs in the metaphysis, epiphyseal extension has been associated with metaphyseal ABC . However, primary ABC of epiphysis is very rare and we could find only one such case report in literature, where proximal tibial epiphysis was primarily involved . Besides surgical treatment, there are various other modalities of treatment like selective arterial embolization, Springs and foam have been used to form emboli. Calcitonin and methylprednisolone injection given intralesionally may be used. Calcium sulphate injecton have been used intralesionally . Adjuvants in the form of liquid nitrogen, phenol or polymethylmethacrylate may be used after surgical excision to minimize recurrence. The recurrence rate of ABC from various surgical modalities is reported to be between 10% to 59% [11,12,13,14,15,16,17,18,19]. It is not clear whether any factors such as age, gender, location, or histologic properties predispose to recurrence. One study suggests a high recurrence rate among very young children . In a study of seven children with an average age of 5.5 years (range, 2.9–10.6 years), recurrence occurred in five of the seven patients. The recurrences appeared rapidly after surgical treatment of curettage (average, 8 months) . Proximity of the bone cyst to the epiphysis also might be a risk factor for recurrence because of difficulty in complete cyst removal in this area. As the recurrence rate is quite high especially in young children and taking into consideration the site (distal ulna) and already total destruction of the epiphysis, we decided to do excision of the distal ulna. However probability of postoperative deformity in later years was explained to the parents and that he may require ulnar lengthening in future. The differential diagnosis of an epiphyseal tumor depends on the age of the patient along with the findings seen on imaging studies. Among the differential diagnosis in a child presenting with an epiphyseal lesion are chondroblastoma, sub -acute osteomyelitis (Brodie’s abscess) and giant cell tumor. According to our patient’s age, the diagnosis of a giant cell tumor seemed highly unlikely, as this tumor is seen more often in the young adults. Brodie’s abscess and chodrblastoma are ruled out by histopathologic examination. 6. Mira JM. 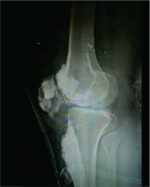 Bonetumors: clinical, radiological and pathologic correlations. Philadelphia: Lea & Fefiger; 1989. pp. 1233–1334.